NFTW Teachers Day Celebrations Programme Details and Guidelines: District Educational Officer, Chittoor District has given instructions in the reference of Proceedings. Rc.No.54/MC/TWF/2014, Dt:20.08.2014 of the Secretary - Treasurer, National Foundation for Teachers Welfare & Commissioner & Director of School Education, A.P.,Hyderabad. to all the Deputy Educational Officers and Mandal Educational Officers in the District are and he has informed that under the aegis of National Foundation for Teachers Welfare Teachers Day will be celebrated on 5th September, 2017 as was done in the previous years. 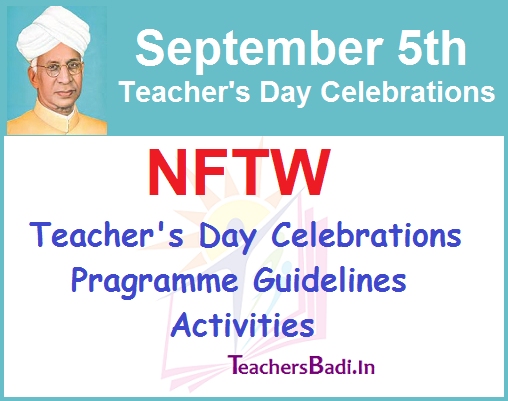 The following instructions are have been issued in connection with the celebration of Teachers day. DEOs has requested to the above said persons to organize the Teachers Day function on 5th September at Mandal level with the co-operation of the committee and important public persons in their mandal and the function may include the following activities. 1. Publication Through Descriptive Posters And Cinema Slides Etc. 5.9.2017 to discuss different aspects of Education and also the role of the teachers to meet the new demands of Education and Society. 3. Organization Of Cultural And Variety Entertainment Programme: The Cultural Organizations as well as dramatic groups, clubs in the Educational Institutions and other organizations etc., may be requested to put special entertainment programmes for one or two days before the Teachers' Day (i.e., 5.9.2017). The gate receipts realized if any, may be sent to the District Educational Officer who will send them to this office through a crossed demand draft in favour of Secretary - Treasurer, National Foundation for Teachers' Welfare, Andhra Pradesh, Hyderabad, payable at Hyderabad. Such receipts may be granted exemption from the payment of entertainment tax. 4. Involving The Industrial Establishment /Industrialist To Contribute / Donate: The industrial Establishments/ Industrialists may be involved to contribute/ donate generously to the corpus of the foundation. Arrangements may be made through Cinema Houses, Educational and Social Welfare Organizations to show selected film on Teachers. 6. Organization Of Sports Meets: Programme like Athletic Meets, friendly cricket matches, football matches etc., may be organized to raise funds for the foundation. In these matches, Ministers, Public representatives, VIPs, teachers and students may be involved. 7. Special Donations From Prominent And Well-To-Do Citizens: The collections may be undertaken under the supervision and the guidance of responsible persons taking all the precautionary measures necessary to prevent mis-appropriation of collections. They may also ask for the co-operation of NSS/NCC/NSC Units and other Voluntary Organizations in the collection of donations and sate of Teachers Day flags to be supplied shortly. The Deputy Educational Officers and Mandal Educational Officers are requested to receive all the collections made in the District and send them to the Secretary-Treasury, National Foundation for Teachers Welfare & Commissioner and Director of School Education, A.P., Hyderabad through Demand Draft drawn in favour of SECRETARY-TREASURER. NATIONAL FOUNDATION FOR TEACHERS WELFARE:: AP:: HYDERABAD, payable at HYDERABAD and send a report to this Office.